Alma Healing, an original sound healing treatment performed by Ayumi Ueda, combines crystal bowls with Reiki, the traditional Japanese hands-on healing method. Ayumi Ueda is a certified Reiki Practitioner and is currently conducting her original sound healing treatment which combines crystal bowls, mantra chanting, and Reiki. 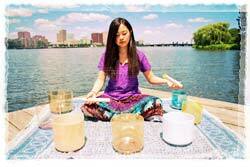 She performs her sound healing treatments for parents of children who are patients at Children's Hospital Boston, and plays crystal bowls to accompany yoga classes and create a relaxing ambiance at SPA Intercontinental Hotel Boston. 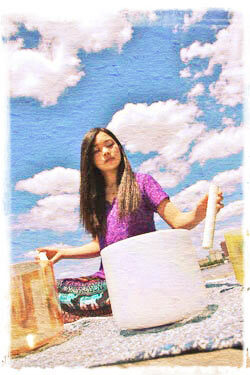 Ayumi also appears as Visiting Artist in Introduction to Music Therapy at Berklee College of Music, where she teaches students about the healing applications of crystal bowls. 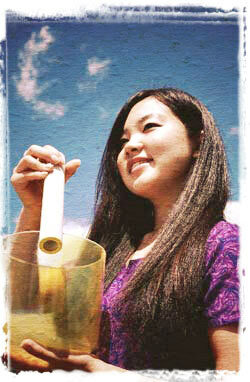 Ayumi was first realized the benefits of music therapy and sound healing during her time at Berklee College of Music. After participating in the World Sound Healing Conference in San Francisco in May 2007, she decided to become a sound healer using crystal bowls and her voice. As a sound healer, Ayumi has participated in numerous festivals and conferences, including the SAS International Therapist Conference held in Sedona, Arizona. As a solo singer, Sound Healer, and Certified Reiki Practitioner, Ayumi works in both the U.S. and Japan, as a multi-talented spiritual artist. The word Alma appears in many world languages. It has many different meanings, including “kind, nourishing, learned” (in English), “soul,” and “singer” (in Arabic). The universal nature of Alma, along with its fusion of meanings, embody the various and holistic aspects of this sound healing treatment. Practitioner will place her hands lightly on or above the body from head to toe, then she will use soothing crystal singing bowls to smooth your energy flow and lead you to deep relaxation. Practitioner will place her hands lightly on or above the body from head to toe, then she will focus on specific points you would like to be treated most. She will then use crystal singing bowls to smooth your energy flow, balance and open your 7 Chakras, and lead you to deep relaxation. Chakra means ‘wheel’ in Sanskrit. It is imperceptible, and comprised of a number of spiritual energy centers in the human body. 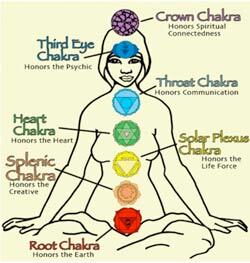 It is usually accepted that there are 7 major chakras going from the base of the spine to the top of the head. 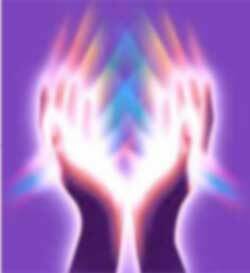 Reiki is the Universal Life Force Energy that flows through and around us and sustains life. Reiki is a hands-on energy therapy that increases the flow of energy to and through the body, enhances the body's natural ability to heal itself, and improves and maintains health. It is a gentle, non-intrusive therapy that reawakens and energizes the body's inner healing powers. Reiki is a simple, natural, and safe method of spiritual healing and self-improvement. It has been effective in treating virtually every known illness and malady, and its effects are always beneficial. It also works in conjunction with all other medical and therapeutic techniques to relieve side effects and promote recovery. Chip Brown, "The Experiments of Dr. Oz," The New York Times Magazine, July 30, 1995, 20-23. L. Gill, "More hospitals offer alternative therapies for mind, body, spirit," USA Today, September 15, 2008. The six crystal singing bowls I use for treatment therapies are made of the highest quality (99.992% pure) quartz crystal, and are incredibly resonant. The tones produced by crystal bowls are not just heard by the ear, but also felt in the body, with certain tones affecting your energy centers (chakras) in a way that promotes healing, balancing, and meditation. Like crystal bowls, our bodies are also crystalline in structure and using crystal bowls for healing can have profound effects on the organs, cells, and skeletal structure, thereby bringing all systems into balance. When we listen to the sound of crystal bowls, there is a resonation, and a harmonization process that occurs between the external and internal vibrations of our bodies. In his groundbreaking book The Healing Power of Sound, Mitchell L. Gaynor, M.D. reports the remarkable results he has achieved in critically ill patients by having them work with vocal toning and crystal bowls. 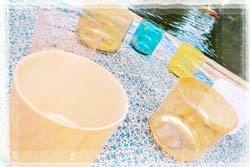 Crystal singing bowls are one of the most powerful spiritual, emotional, and physical healing methods. 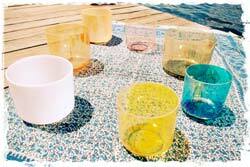 The initial effect of experiencing crystal bowls is a relaxation of the body and mind. Once calmness is restored, the sound frequencies stimulate the chakras, brain, and nervous system. When we listen to the bowls with focused, positive thought, the results are even more powerful. 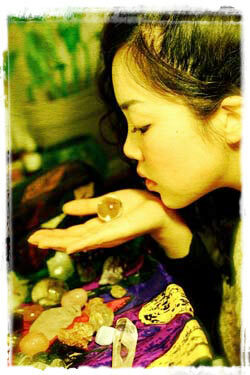 After Reiki, Crystal Bowl treatment, many experience a cleansing reaction. A “cleansing reaction” is a natural, significant body-initiated process that occurs when accumulated toxins and/or emotions are eliminated from the body. Cleansing reactions may manifest as a slight fever, a runny nose, a cough, increased perspiration, or an urge to release water more often. All these symptoms signal that something in the body has been dislodged, and that something that does not belong there is being released. These symptoms last roughly a few hours to one day. If you experience a cleansing reaction, please take plenty of water and a good amount of rest. Reiki, Crystal Bowl treatment is not a medical treatment and should never replace or delay medical or psychological treatment of an illness, injury or medications, but is a complimentary treatment that will help improve results by shortening healing time, reducing pain and stress, and producing positive energy states of consciousness. If you feel uncomfortable after the treatment, please contact me immediately and or, please contact your personal doctor. E-mail info@almavoice.com or contact from the contact form with the information listed below. If you have any questions, feel free to contact at info@almavoice.com or contact from the contact form.